The Pacific Region Contaminants Atlas (PRCA) is an online resource tool which was designed to explore environmental contaminant topics in British Columbia, Canada. Information sharing is vital to the effective decision-making by stakeholders and this Atlas provides access to scientific and technical information to support such decision-making by providing information on current and emerging issues, future needs, past successes and continuing concerns with respect to contaminants in the Pacific Region. The industrialized and urbanized Georgia Basin, situated in the southwestern corner of British Columbia, is a key area of concern and is the current focus of the PRCA. 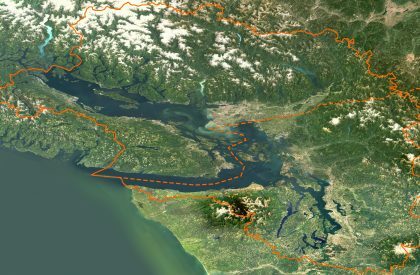 While the initial focus of the Atlas has been the Georgia Basin, the PRCA was intentionally designed to allow for expansion to include other important eco-regions within British Columbia, Yukon and the Northwest Pacific Coast of the United States. To address the needs of a wide range of stakeholders, from the general public to researchers and regulators, the PRCA provides information on environmental contaminants at various levels of detail. The various sections of the Atlas provide brief summaries on topics of interest; however, more detailed information on these issues can easily be accessed through links to fact sheets and other websites. Information is provided on sources and environmental levels of contaminants, current issues and species of concern, such as killer whales and Chinook salmon, as well as government actions and community partnerships currently underway to address these concerns. In addition, suggestions are made regarding actions and choices that we can all make, on an individual basis, to minimize our contributions of contaminants to the environment. To further assist in accessing information, the PRCA contains a series of Tools: Map Explorer contains over 200 maps depicting information and datasets on contaminants and their potential sources as well as physical features, human use, natural resources, and sensitive and protected areas within the province. For example, individual map layers identify and provide information on industrial and municipal wastewater discharges, sewers, and abandoned/historic mines; atmospheric deposition; crucial areas with respect to habitat, migration, and distribution of numerous species, including salmon and killer whales; shellfish closure areas; regional land use and land cover; and many more important topics. These layers can be viewed individually or in a multitude of combinations. Contaminants Database Search Engine is a geographically referenced searchable database of published literature relating to environmental contaminants in the Georgia Basin and other areas of British Columbia. Searches can be conducted based on specific contaminant, source, environmental media, or by geographic area within the province (Regional District or watershed), or by a combination of these variables. The Continental and Oceanographic Data Information System (CODIS) is a database of metadata of Canada’s Arctic and Pacific Ocean datasets of environmental information. CODIS was originally developed by Fisheries and Oceans Canada (DFO); however it is no longer being maintained by DFO. To ensure that the information contained in this database remains available for use, CODIS now resides on the PRCA as a valuable resource tool. In addition, the Atlas includes a Kids’ Page, an engaging and entertaining tool which provides educational information on environmental contaminants for school-age children. Kids’ Page can be accessed by clicking on the special “Frogman” icon. The development of the PRCA was funded, in part, by the Georgia Basin Action Plan (GBAP) and was created through extensive consultations between Environment Canada, Fisheries and Oceans Canada, BC Ministry of Environment, Community Mapping Network, and the BC Conservation Foundation.